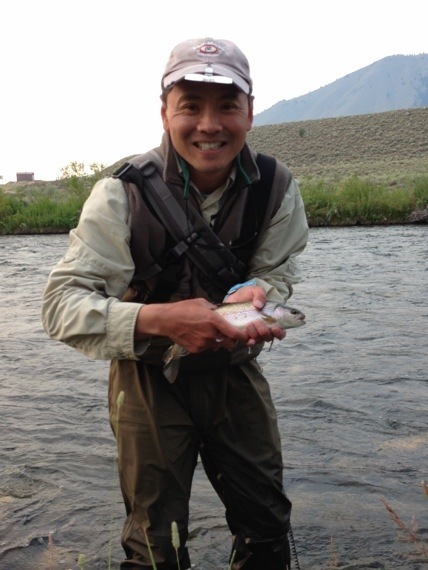 One my of dreams as a boy was to fly fish the Madison River. I’m living that dream right now. We are renting a house on the Upper Madison. My Montana-based sister-in-law and her family have joined us, and all together, we are a party of 12. We have a list of various chores that we divide up, and once I’ve done mine, I’m a free man. The kids are happy going to Yellowstone with their cousins, and my wife is enjoying spending time with her sister, with whom she is very close. I’ve a hall pass to fish, and am doing so for 9 to 12 hours each day. My finger tips are bleeding from handling so much line. I admit that I’ve had tears in my eyes a few times while I am on the river. I am that happy. I caught a fish near the house after a long day with many trout, and my wife snapped the picture above. The hours on the river go by incredibly quickly. Everywhere, and all around, there is incredible beauty. Up ahead, you see hawks circling, hunting for trout. The scenery all around you is of a beautiful mountain range and a twisty, turn-y river that beckons you with cold water, beautiful rapids, and deep pools. Verdant meadows abound. As an extrovert in an outbound job, it may sound weird to be alone on a river all day. But, fly fishing is a bit like skiing. Your brain is always on. One wrong move, and you fall into the river. You’re constantly stalking for trout, anticipating where they may be, and being hyper-vigilant to have a drag-free float of the fly (trout will ignore flies that don’t ride naturally in the current). You’re on the look-out for what bugs may be hatching. And, you’re often changing flies to see what will work. It is hard to predict the trout out here. One day, in one spot, I had a dozen strikes. The next day, I went back: nothing. Some days I catch a lot of fish. On other days, not many. The fishing here hasn’t been easy. The water level is very low, and so, to find the bigger fish, you have to trudge to the middle of the river, where the current is strong, and the water is deeper and can sweep you off your feet. Also, the trout in the Madison are wily. It is catch-and-release out here and the fish are wild. So, over time, they get very experienced and tough to catch. You feel the tug on your line. There is a surge of adrenalin when you hook a fish and fight it. Then, relief and joy when you successfully net it. Completely amped-up happiness. Then, you release the fish and watch it slowly swim away. You feel a little sad as the trout flicks its tail and disappears. I’ve had some good luck, including a 20″ brown and a 17″ rainbow, among quite a few others. Beautiful fish. Some look silver, others are greenish-yellow, and the rest are a translucent glow of blue, red and pink. I first fished the Madison in 1992. This year was my 21st year going back. I used to drive from river to river in Montana. Now I only fish a few rivers in order to do more fishing and less driving. I spent about two weeks on the Madison. Most of it was excellent fishing between Quake Lake and $3 Bridge. Your entry didn’t mention the dates you were on the Madison. Perhaps you’re still there. The current flow is at 851 cfs, which is about normal for this time of year. In July the flow was fluctuated quite drastically due to “pulsing.” They needed to reduce temperatures below Ennis Lake, so they let out a lot of water from the lake. Then they had to refill that lake from Hebgen Lake. Water temperatures on the Madison have been high for years now. The reason is that the dam is being worked on and water is being let out from the top of the lake. Midday the river’s temperature reached 70+ degrees in July. Now the highs are around 68 degrees. Repairs on the dam should be finished by either 2014 or 2015. Once that’s done, fishing should improve–assuming an adequate snow pack. You mentioned wading out into the river. I suggest you don’t disregard undercut banks. I caught plenty of browns within a foot of the bank in just 6-8 inches of water. You just need to know where the likely spots are. I certainly understand your enthusiasm for the Madison. It’s one of the most beautiful streams to fish and it’s consistently producing a good number of beautiful trout. Frank, thanks for the thoughtful reply. I cannot wait for that dam to be fixed and create a more cool river for the fish. Great comment about the banks. I once almost stepped on a huge brown in about 6″ of water. Looking for hoppers, I suspect. I love the Madison, particularly the area around Reynolds Pass. I gotta to back.